in the heart of Edinburgh! Part of a season of French film noir to coincide with the 100th anniversary of the birth of legendary crime author and master of ’argot’ Auguste Le Breton. Get ready for some Rififi ! 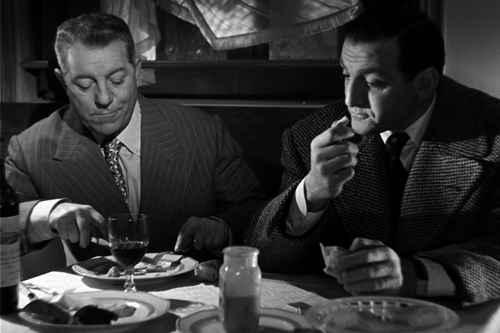 Jean Gabin plays Henri Ferré aka Le Nantais, the curiously sympathetic head of an international narcotics ring, invited from across the Atlantic to oversee the European branch of his operation. Using the fancy restaurant ‘Le Troquet’ as a cover, the drug lord keeps his fingers in several crooked pies. the screening courtesy of Innis & Gunn. Le Breton established himself as an emblematic author with a special insight into the world of French criminal underworld. Close to the Parisian mob, he frequented the bars, gambling dens and gangs of Montmartre and gathered real life experiences which he nourished his novels with. Inventor of the word ‘Rififi’, he is best known for having introduced argot and slang to literature and for the screen adaptations of many of his novels that instantly became noir classics.